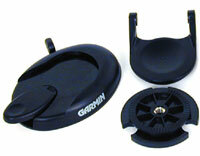 Garmin Universal Adhesive Mounting Adapter (010-10353-00) €24.00 - buy online at mysatnav.ie - Ireland's leading GPS & Sat Nav store. This is a universal mounting adapter and includes auto mount converter bases. One is to convert the Garmin Suction Cup Mounts or the Garmin Swivel Mounts to an Auto Mount, and the other is to convert the GPSMAP 176 series Swivel Mount to an Auto Mount.&nsbp; The kit comes with a permanent and a temporary adhesive to attach the mount to the dash. For flexibility we recommend using the temporary adhesive.